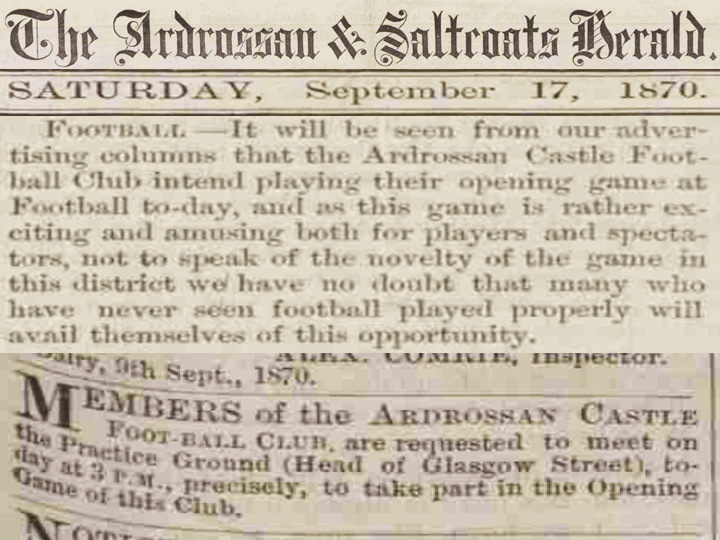 played in Ardrossan, superseding the previous belief that the first game was on 13 September 1874. Ardrossan is a town in Ayrshire, Scotland. The first formal football match in Ardrossan was played on 17 September 1870 at Clutha Park, a field between Glasgow Street and Paisley Street, in what is now Young Street. That first team was called Ardrossan Castle Football Club and was one of several founded then disbanded before the town's current and longest-lasting club, Ardrossan Winton Rovers, was formed in 1900. This website gives details of these clubs. First-time visitors might consider using the glossary before browsing further.